I have a main menu with several blue icons. I have set up a visited state for each icon, so I can track what icons the learner has visited/seen/clicked (the icon turns gray). The visited states are saved when the user decides to take a break and exits the course. When they come back to the course, the main menu reflects the icons they have already visited (which are now gray) and the icons they have yet to lock on (which are blue). I have several other slides with several objects (full color). Each icons also has a visited state (gray). The visited states of the objects are set-up so that their visited states should be saved when the user decides to take a break and exits the course. When they come back to the course, they should be gray. Instead, what is happening is that when the user comes back to the courses, these icons go back to their original state (full color). Not sure why the visted state / resume saved state function is working on the main menu slide but not the subsequent slides...? -I have ensured all slides and layers have "resume saved state" in the slide properties. -I have ensured that the 'change state of XYZ object to visited' is 1st in line in the order of triggers. -I have also tried to create a true/false variable for one of the objects. The visited state did not save - in other words, when the user came back to the course, the object was in full color again - instead of being grayed out. Any help / troubleshooting would be most appreciated. Thank you! This could be a couple of things, but one place to look is the Slide Properties, which is found by clicking the "Gear" icon on the right side of the slide layer. Check what you have selected for "When revisiting". 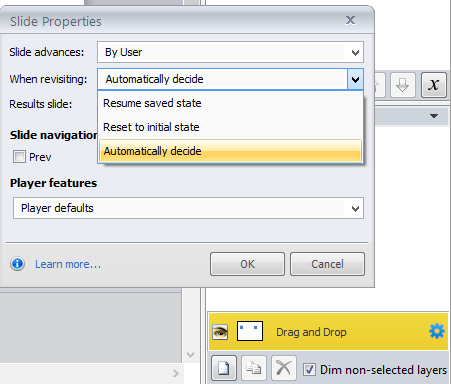 I think you would want "Resume saved state"
Yep, I've ensure all slides and layers are set to 'resume saved state'. I'm stumped. I'm sure you have, but I'll mention this because I know I have done this. Double check the programming on the objects that aren't working. 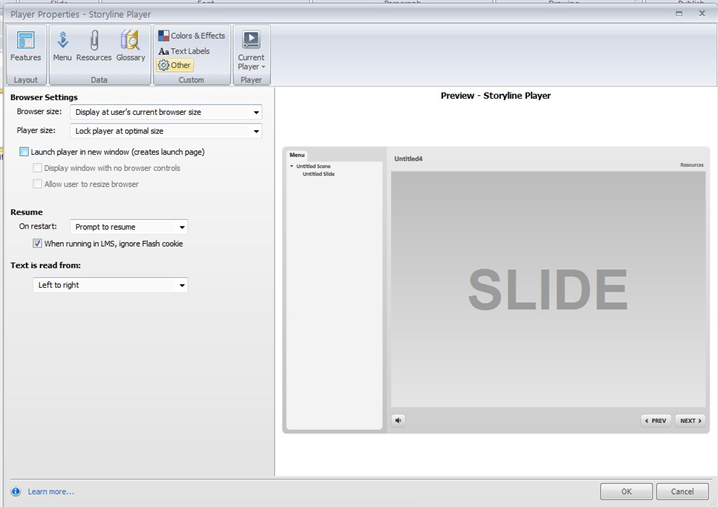 Try copying and pasting an object from the menu that you know works as intended and pasting it onto your other slide. Previewing to see if behaves on that slide in the same way as it does on the menu. Go to player....click "other" under text labels.....In the resume section on restart select always resume.